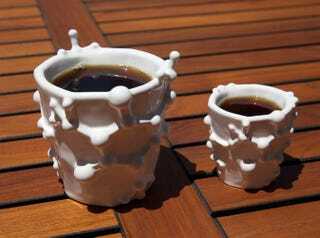 The only thing better than caffeine is more caffeine* (except when it isn't), which could make this mug/espresso cup combo, both of which are modeled after the atomic structure of caffeine, the greatest coffee receptacles in existence. Designed by Joaquin Baldwin, these beauties are available online over at Shapeways. Grab one for the scientifically inclined coffee-drinker in your life. Or don't. Odds are they're already drinking too much of the stuff. *Similarly, the only thing better than one image of Fry drinking coffee is more than one image of Fry drinking coffee.